CCS is in a relatively early phase of development, with several key questions remaining, including its costs, timing, and relative attractiveness versus other low carbon opportunities. Furthermore a survey in April 2007 by MIT showed low public awareness of CCS in the US. Other interviews have shown that some confusion around the true economics of CCS exists, exacerbated by the wide range of cost numbers quoted and the limited information on how they are derived. 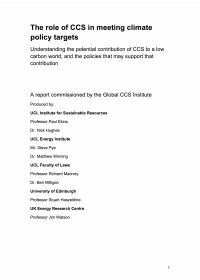 For these reasons, this report aims to create a brief, objective, fact-based, and generally accessible overview of CCS, focusing on the economics and key issues, to help stakeholders understand and assess the technology. It will look ahead as far as 2030. The report has built as much as possible on existing knowledge. It has been based on technologies and measures that are currently relatively well known and understood and likely to be commercially available within the time period covered in this report.